Via telephone, email or personal meeting. Discuss the type of event, date, style, color, font, theme (if any). Discuss time frame and budget. Submit signed proposal for clients acceptance with non-refundable $30.00 deposit. Supply 2-3 design concepts for clients review via digital PDF format or personal meeting. Up to 2 revisions included, then after 2nd revision additional payment is required by the hour. Upon 1st proof processing 50% of the payment is due. Second or Final Proof is processed with clients signed approval. Prior to print Final Proof is approved by client via email, PDF format, fax or personal meeting. Prior to order shipment or delivery final payment is received. Order is shipped via UPS Ground, shipping included on invoice. Samples are available for order and sent with example wording. Sample request! 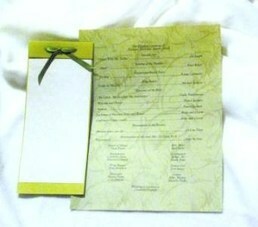 Shown above: Invitation with 4 1/8″ x 9 1/2″ coordinating envelope.